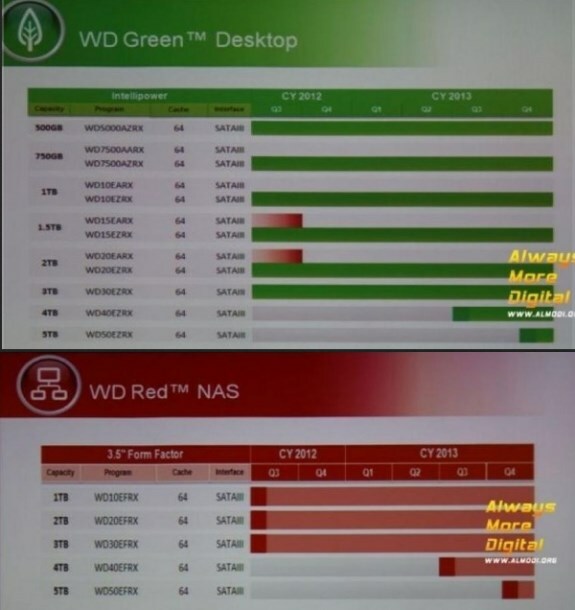 TechPowerUp came across leaked roadmaps that show Western Digital's plans for its NAS-optimized Red and energy-efficient Green hard drive lineups. The slides reveal that we can expect the first 5TB HDDs about a year from now. A little earlier than that, the two lines will be updated with 4 TB variants, the WD40ERFX and WD40EZRX. All four drives feature 64 MB of cache, SATA 6 Gb/s interface, and are built in the 3.5-inch form-factor.